The new Infiltrator reinforcement class is being added to Star Wars™ Battlefront™ II on March 26. On March 26*, the Infiltrator reinforcement class is introduced to Star Wars™ Battlefront™ II. Infiltrators are highly skilled, tactical elite soldiers thriving on the hunt, equipped with weapons and devices suited for close-quarters encounters. Let’s take a closer look at what’s in store. In Star Wars™ Battlefront™ II, the ARC Trooper wields two DC-17 hand blasters, a pistol carried by high-ranking members of the clone army. Making the ARC Trooper a lethal opponent in close quarters, the dual blasters are fired individually by pressing the triggers or mouse buttons. Make the most of it, soldier! The BX Commando Droid onboard the Separatist Dreadnought. 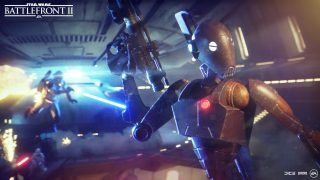 Imagine this scenario: the BX Commando Droid is part of an invasion squad boarding the Republic Attack Cruiser in a game of Capital Supremacy. Making their way through the corridors leading to one of the ship’s reactor cores, the squad stumbles into heavy resistance from a legion of clone troopers. Blaster fire rips through the air immediately. The BX Commando Droid returns the favor and advances towards the enemy. Its advanced combat programming (or rather, the skill of the player) is now put to the test. Quickly assessing the situation, the droid pops the Smoke Screen and switches on the Scanner, effectively seeing the clones through the smoke filling up the hallway. It keeps firing the E-5 rifle until it’s overheated, dropping each of the clones’ health quickly – now disoriented by being so accurately targeted from the hidden enemy. The BX Commando Droid emerges from the haze, draws the vibrosword, and deals out three strikes in quick succession. Same number of clones fall to the ground. The Infiltrator class reinforcements arrive on March 26. Keep an eye out on this space for more news on Star Wars Battlefront II. Also, make sure to join the discussions on our official forums or on social – follow EA Star Wars on Twitter, Facebook, and Instagram, and sign up today to receive the latest Star Wars Battlefront II news, updates, behind-the-scenes content, exclusive offers, and more (including other EA news, products, events, and promotions) by email.